yhs.yarmouth.k12.me.us/. The flags are presented as a "slide show" movie and there are three films showing the presentation of the five final designs to the Town Council, the Town Vote on the best design, and the presentation of the best design to the Town Meeting on 10 June 2003. The winning design by Ben Colclio is blue with a white oval in the center bearing a drawing of a full rigged ship sailing towards the fly end, with the word "Yarmouth" arched over the top of the ship on the white oval and the date "1849" below. The ship drawing is black and the lettering is blue. The ship drawing and lettering are blue. I am uncertain if this means the flag is the official design or not and I am contacting the Town to find out. On another site the flag of Yarmouth is shown as blue with seal in the center: tea.armadaproject.org/ (photo 11). This design, also from 2003, was made for a trip by students to the Antarctic. It was a "one-off" flag and entirely made up for the trip. 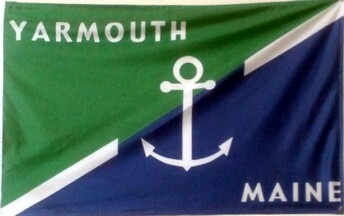 This flag was posted on the FOTW-facebook page, and was seen in the Yarmouth High School during the 2013 Clam Festival.